Camping is a practical way to vacation in Snowdonia National Park. Well located, clean and well-maintained campsites are often much closer to lakes, trails and other park attractions than the scattered villages and towns. And the feeling of being sheltered by Snowdonia's towering peaks is magic. We've heard good things about these top eight campsites. A campsite and bunkhouse on a 750 acre National Trust farm, this has been named one "50 Best Campsites in the World" by a UK newspaper. It's location, between the village of Capel Curig and the ribbon lake Llyn Ogwen, is ravishing. and it is surrounded by two of Snowdonia's mountain ranges - the Carneddau and the Glyderau ( often called "The Glyders" by old Snowdonia hands. It's recommended as a great base for families, climbers, and hikers. Run by the Williams family, the current owners are the 8th generation of the same family that founded it in 1906. In addition to the camping field — for tents and with hookups for camper vans, there are also two bunkhouses that together can accommodate 18. For outdoor activity enthusiasts, camping and abseiling are available right on the site. And the National Mountaineering Centre at Plas-y-Brenin is only three miles away. Sadly, no dogs.The site is open year round and is remarkably cheap for its beautiful location outside of Capel Curig. Near Llanrwst, a small market town that claims to be the 'capital' of the Conwy Valley, this campsite may be priced a bit steeply for ordinary tent pitches but it is a fairly-priced award winner for caravans. The 35 caravan pitches are all hard standings with multiple utilities. They offer standard pitches for tents with no services or serviced pitches with electric and TV hookups. It's run by the a Welsh-speaking farm family and antique farm implements are a feature of the landscaping. Hayfever sufferers beware — it's landscaped to within an inch of its life, having won the "Wales in Bloom" Award for touring caravan sites for more than 26 years in a row. The site is level and has a separate toilet block with facilities for the disabled. Close to Bala Lake, this family run, 4-star camping and caravan park, is popular with watersports enthusiasts .It offers tent camping on Bala Lake, caravan and motorhome camping in Bala Town and if you prefer to dip your toe in the camping waters with a bit of luxury, there's glamping in a traditional, bow-top gypsy caravan or "the little green hut". It's within 100 yards of the lake, known for its water sports. Dogs are allowed in the dog-friendly tent site. Open from mid-March to the end of October, there are seasonal pitches for visitors who want a place to leave their caravan while they explore the rest of North Wales. This campsite sits in one of the most beautiful valleys in Snowdonia, Nantgwynant. 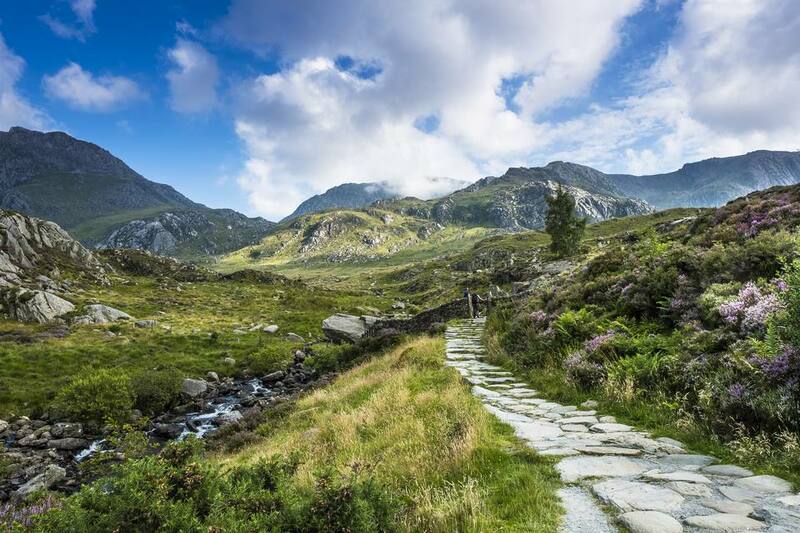 Close to swimming, walking trails and adventure activities, you can walk up Snowdon directly from the campsite. Best of all, if you still dream of the freedom of camping — hitting the open road in your campervan and stopping wherever you please, this is the place. No reservations are required for groups of less than 20. So show up and if there's room, you are welcome. Peace and quiet is assured as there are no radios allowed on the site, only acoustic music and that only until 11 p.m. The site is open year round for all-weather back to nature enthusiasts. Separate caravan and tent camping areas ensure that different styles of camping are catered for here. This camp, near Bala and Bala Lake, is convenient for watersports and the National Whitewater Centre is just a five-minute walk. There's also fishing, by permission, at this riverside site. Recent additions are two large and secluded Lotus Belle glamping tents, fully equipped with beds, bedding and linens as well a cooking equipment and an indoor wood burning stove to take the chill off cooler nights. If you fancy the idea of boating to your campsite, this working boatyard on the Dyfi Estuary might be just the thing. There are tent pitches on a raised slate plateau as well as holiday cottages, and a ramshackle grounded Scottish fishing boat, the Boy John, suitable for two. For boat owners, there are moorings and all the other facilities you might expect at a working boatyard. This site regularly makes top ten lists. It offers glamping, traditional camping, cottages, and slate shed B&B. Glampers are spoiled for choice with bell tents, yurts, pop up yurts and a Welsh cabin — a romantic wooden pavilion suitable for two. The touring campsite on the Mawddach Estuary has pitches for tents, caravans and camper vans. This is a wild - or tent - camping site for people who like to have their cake and eat it too. It's field camping, near the shores of Llyn Cwellyn at the base of Mt Snowdon. But there are plenty of home comforts after a night in a grassy field. There are firepits on wheels so that you can reminisce around a campfire before unrolling your sleeping bag for the night. The moderb shower and toilet block is open 24/7 and, for those cold camping mornings, the floors are heated. And, if you'd like someone else to cook you breakfast and dinner in a real kitchen, the associated Cwellyn Arms Hotel is just a 15 minute walk away. This is a very quiet, peaceful and scenic lakeside camp.